Wow, what a week it has been for this furry orange monster. PAX East, interviewing Fred Howard from KingsIsle, guest hosting Ravenwood Radio, getting my stories posted or linked on Beckett MOG and MMO Crunch and who knows where else… It really all comes down to having the BEST community of any game out there, and having amazing and supportive fans and followers! I couldn’t do any of this without all of you! Well, I COULD do this without you, sure, but what would be the point really? It would kind of be like talking to myself, wouldn’t it? And there’s nothing sadder than a furry orange monster just sitting there talking to himself… oh wait, where was I? 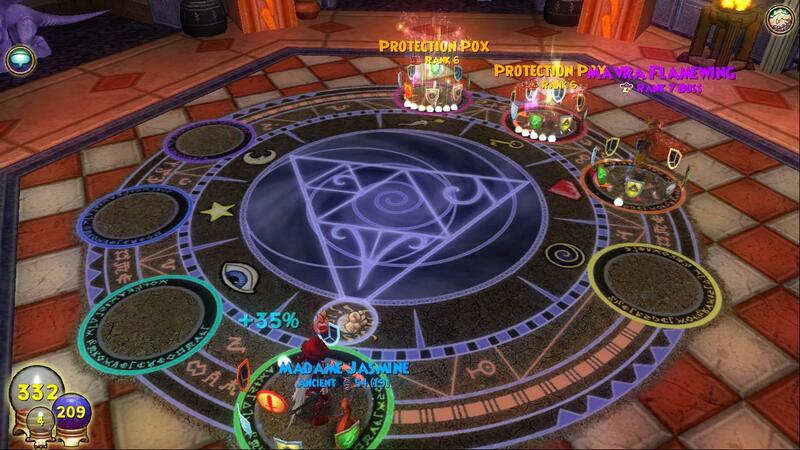 Oh yes – back to Wizard 101, since I’ve had a few spare minutes this week to jump back in. Inspired by all the pet talk this week, I’ve started training Madame Jasmine again and got her to Ancient, I’ll keep working with her until she’s all the way to ‘super old’ or whatever they call it…. I’ve also been working my way through DragonSpyre – this place is pretty terrifying! It seems like every other fight is a boss fight or else you’ve got to get through a tower with like seventy levels of elite battles to get to your end goal, which is usually just reading a book, and sometimes eating pudding. It’s very exciting though! Well, maybe not the pudding, but all the other stuff is really exciting! 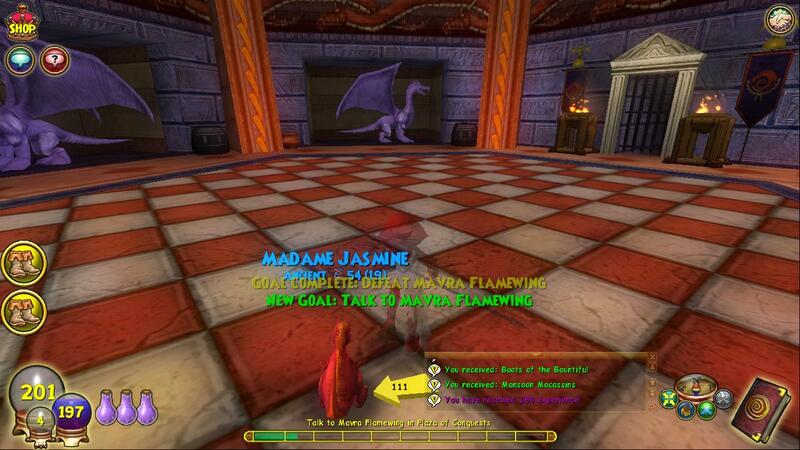 And speaking of exciting – I’m working my way through the Plaza of Conquests now and had to go talk to Mavra Flamewing for ‘shield training’. I’m not sure where she got her teaching degree, but I was under the impression that saying ‘Here’s a storm shark, good luck with it’ wasn’t really ‘teaching’… This turned out to be the most difficult fight of the game, I think! Mavra and her shiled-tossing minions! For anyone who hasn’t gotten to DragonSpyre or hasn’t made it to this quest, Mavra is a storm boss with 2000 health – certainly not huge, I’ve taken out bigger and meaner. The trick is that she has two ‘minions’ with her, which are these little ‘protective pox’ critters that do nothing but throw out every shield imaginable. Elemental shields, absorbs, tower shields, you name it, they shield themselves – and Mavra – with them. Sure it’s nice that they don’t hit you with damage, but putting up to three shields up (one from each pox AND Mavra, and yes they CAN all land on the same target, I’ve seen it done) every turn makes dealing damage VERY tricky! Fortunately, as a pyromnacer I can specialize in damage over time, which it seems to me is the only way to beat this foe, at least solo. I got rid of helephants and even my beloved meteor strikes and loaded up with link, scald, even fire elf and heck hounds, as well as every shield I could personally carry, then maxed out healing spells and dove into the duel. The duel took a long time – I’d say 20 minutes? Wasn’t paying that close attention but it was around there. I would toss up a shield and then hit with a DOT spell, trying to stack as many DOT as I could. Scald was really nice because it hit all enemies, so I was slowly working the pox’s down as I was focused on Mavra. Oh yes unlike most boss fights where you try to take out the minion first, because it’s quicker, for this fight I recommend going after Mavra 100% until she’s down, because once she’s down the Pox minions can’t hurt you, so you’ve bacially got as long as you need (or have cards) to take care of them, and without Mavra raining damage down on your head every other turn, it’s much less stressful! In the end, it was a double stacked ‘scald’ that won the day and got me my victory dance. I kind of wish I have taken video of this fight, but honestly it would have been twenty minutes of me whining about yet ANOTHER shield going up and ruining my winning shot…. See you in the Spiral, keep playing safe!! This entry was posted on March 18, 2011 by dittowizard. It was filed under Fabricated American, Gaming, Wizard 101 . Agreed on both the awesome community, and the pox battle. Gratz, Ditto, on all your furry orange accomplishments! You truly are a valuable inspiration to the Spiral! Ditto-I’ve tried it both ways and it turns out that it is significantly easier if you focus on taking out the pox minions first, then go after the boss. She doesn’t really do that much damage so it works better than you’d expect. And as you said, DOT spells are the only way to go for this. If you’re not a pyromancer, buy a bunch of cheap Fire Elf treasure cards adn load your sideboard with them. Happy Birthday, Ditto! Hope you and Miss Narrator have an excellent day! Awesome, I bet it would be hard alone but with the power of friendship, nothings impossible, even flying (with wings or a dragon)! Yet they were nothing Earthquake couldn’t take.